Finishing in 1st place and winner of the Rod Bender Bait award. Frank and Nick brought 19.81lb. to the scales with a 4.82 lb. Big Bass earning $734 in cash. Mike and Colin brought 17.01 lb. with a 4.26 Big Bass to the scales earning them $459 in cash. Mike and Colin spent three days scouting areas and locating fish. For tournament day, they chose an area in the middle channel between Algonac and the main lake that had a grass bed in 14’ of water that held Smallmouth. The team split duties, one fished swim baits putting two in the boat and the other partner drug a tube through and out of a point in the grass and had five keeper bites on the tube. ​Zach and Cole brought 16.65 lb. with a 3.78 Big Bass to the scales earning them $275 in cash. During practice Zack and Cole moved around the lake. 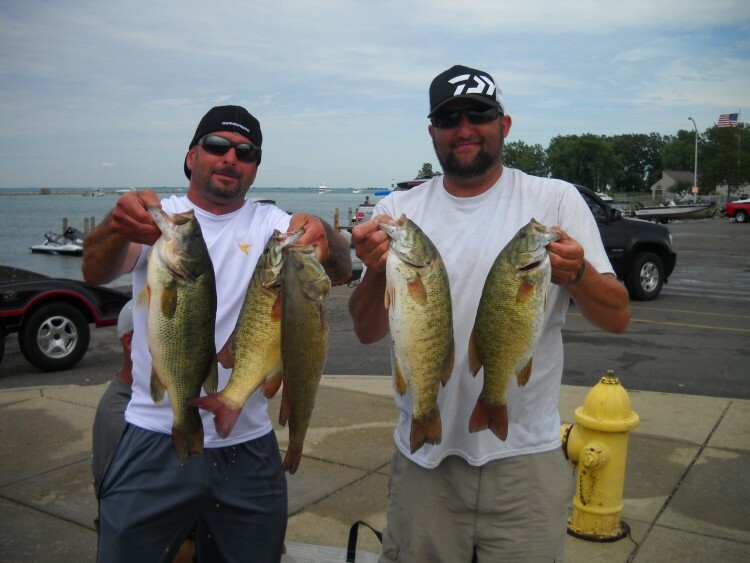 They found fish south at the Detroit River the best of which was a 4 and a half pound largemouth. Moving north they fished a waypoint shared to them by Cole’s dad also fishing the R&B east. Dad’s spot was a narrow 20’ long Zebra Mussel bed on the eastern edge of US waters of the main lake near the shipping channel. ​Bear and Mike brought 16.62 lb. with a 3.56 Big Bass to the scales earning them $184 in cash. Joe and Rick brought in 16.45 lb. with a .25 dead fish penalty netting them 16.20 with a 4.53 Big Bass to the scales earning them $110 in cash. Jon and John brought 15.91lb. with the Big Bass of the day at 5.25lb. to the scales earning them $73 in cash for the 6th place finish and $280 for the Big Bass. 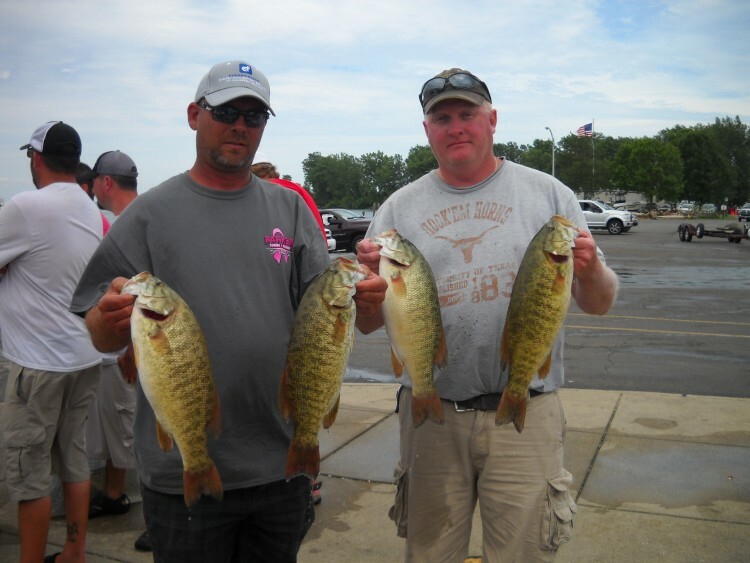 ​​Rick and Denny Also finished 1st out of the money placing 7th with 16.00 lb. Out of "the money" but in addition to the Rocky Brook award the two earned a little take home cash with that 5.05lb big bass. ​Sponsored by Schnelker Marine and ProX Outfitters, the team that finishes 16th in each Eastern Division Tournament of the R & B Bass Circuit will win a $25 gift card. The card may be used at either Schnelker Marine or Pro X Outfitters rather in store or online. ​​The team weighed in with 5 fish weighing 14.07lb. and 3.5lb. Big Bass.. 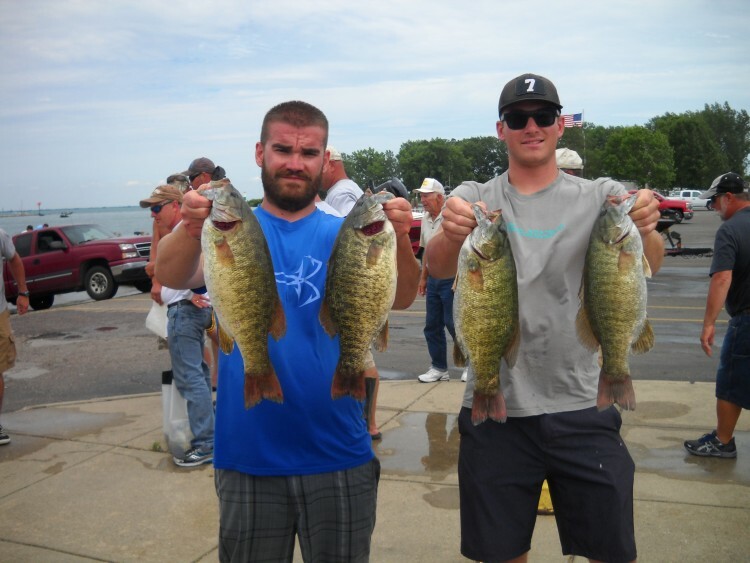 The R & B Bass Circuit Eastern Division launched at Harley Ensign at Lake St. Clair on July 17th. Several teams opted out of the tournament be we launched 35 boats with 32 teams bringing fish to the scale. Although the afternoon turned windy with winds out of the south, all made it back safely. ​1st place took 19.81 Lb. to win, and participants weighed in 144 bass and 413.08 pounds of fish. On a all to common NOTE: I discovered when I was doing the points for St. Clair that once again the cash did not match the payout. We had 34 teams paid in the cash box. We counted 34 teams on paper, however, the back up paper copy got wet at the pre tournament meeting and later fell apart, so I cannot verify entries. We paid out 34 teams and the cash box balanced at $198 for the classic fund. I was relieved on the way home that we got it right:) That being said I do have 35 chips drawn and I have 35 teams awarded points at weighin. Moving to a second spot, they fished a seawall where they boated one of their biggest Largemouths of the day. They finished the day by moving to the south side of Anchor Bay and culled again bringing in a total of about 12+ keepers to sort through and netting them a total weight of 17.01 pounds. ​​During their only day of practice the two located a spot cranking in 9’ of water, no discernible weed changes or rock present with no real reason to hold fish but there were fish present and they were catchable. ​Early on Sunday Frank and Nick fished a hump in 14’ of water that produced 1 bite. Moving to their second spot, a weedy inside turn produced a second fish. Nick said that they continued to fish and put 9 or 10 keepers in the boat using a C-Flash Magnum in Brown Craw all within the first hour and a half. They made a run to their 9’ deep spot found in practice with the plan to stay no longer then 12:00. Fishing was slow and they were getting ready to leave and head back to the hump when at 11:45 they put their first 5 pounder in the boat. This prompted a time extension and at 12:15 they put their second 5 pounder in the boat using a spy bait. With the wind starting to blow, their hump on the main lake had become unfishable so they finished out the day in their non-descript spot with the 19.81 pounds of fish they had. The wind was not a factor during practice allowing them to line the boat up at the long end of the shell bed. Dragging a tube and both fishing from the front deck they boated a 2.5 pounder in the first 5 minutes. In a short time they had lost a 6 pound smallie with each angler netting two 5 pounders and two 4 pounders. On Sunday they made the run to their shell bed. The wind was blowing in the opposite direction and holding the boat in the same position as Saturday near impossible. Boat position being critical, the solution came from one teammate holding the bow into the wind and the other fishing the shell bed from the back of the boat to duplicate Saturday’s success. Cole said the key lure for all of the fish they weighed in was a ProX tube 3 ½” Green Pumpkin Smoke. After culling through several fish the teammates ended up bringing in 16.65 pounds to the scales. Click here for the complete St. Clair Results.